Salite ai punti più alti della foresta pluviale di Arenal con una escursione in teleferica da La Fortuna. Dirigiti verso Sky Adventures nell'Arenal Park per volare attraverso il baldacchino in un tour pieno di adrenalina, imparando la flora e la fauna locali e ammirando le viste mentre vai. Incontra la tua guida a Sky Adventures nell'Arenal Park per le 10:30, le 12:30 o le 15:00. tour. Salire fino a 1250 metri (1.250 metri) nel baldacchino in una gondola a cielo aperto fino a raggiungere un ponte di osservazione con vista sul vulcano Arenal e sul lago. 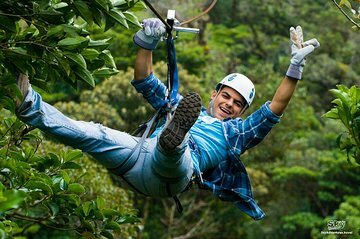 Osserva il punto di vista, quindi agganciati all'imbracatura per iniziare l'avventura di zipline. Per due ore intere, percorri una serie di sette cavi lungo la foresta pluviale costaricana in un tour garantito per soddisfare i viaggiatori di tutte le età e abilità. Tra i picchi di adrenalina, fai attenzione agli animali selvatici come scimmie urlatrici, tucani e iguane dalle piattaforme. Fai ritorno al tuo hotel circa due ore e mezza dopo l'ora di inizio del tour. Workers were very nice and helpful. We did not have to wait long between rides. We had a great time. It was a little more intense than I thought, but our guides where well trained and made me feel safe. Levi, Glberth, Kevin, and Nelson were so fun and did a great job! The reason I gave this 3 stars is because of the weather clearly, NOT the fault of Viator tours or the Sky Adventure Park. We booked the ziplining adventure several weeks before our trip. On the day we were booked to go, the skies opened and we were ziplining in a torrential downpour. So, for the first zipline, we were in a low lying cloud and couldn't see a thing. After that, the rain was so hard that you could barely open your eyes, plus we were all freezing and soaking wet. The employees of the zipline were fabulous, it was very organized and the equipment was great. So, my advice would be to wait until a few days before to book your tour, because I did not love paying almost 300 for 4 people and be miserable due to the weather. Great fun ziplining very high over the canopy. The guides were great and the experience fantastic. The cost was reasonable except for the photos. It was 57 for very few photos because the equipment which catches you coming into the landing platform was not working. So the only photos are leaving the platform. They should of charged less due to that but we wanted to have something to remember the trip by so we bought them. Great fun would highly recommend. Excellent fun. Scary and Exciting. The guides on the zip lines were personable, funny and fun! We scheduled the 12:30 zip line tour/gondola ride. It was a great experience. The operators were all very nice,informative, and funny. They made us feel very comfortable and safe riding the zip line. It's pretty cool to zoom over the tree tops of the rain forest, I may have considered a hike or hanging bridge after but I did not book it. I defiantly recommend doing this while in Costa Rica. We're old and out of shape, but decided to feel like we're teenagers again! Had a great time and we have this fond memory to bring back with us! We were totally comfortable with the staff and felt their attention to safety was paramount. These folks really set our mind at ease! Also loved the professional photos ...now we can prove to our grandchildren that we actually did this!